Coming from any direction, the winding drive to the Oregon Coast sure is a pretty one. From Eugene, take Hwy 126 through Mapleton. 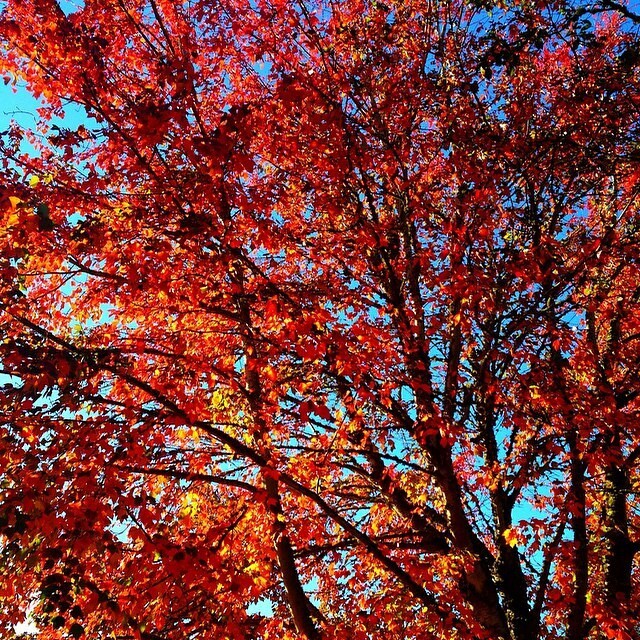 As its namesake may hint, Mapleton is full of vibrant, orange, maple trees, but that’s not all. Be on the lookout for golden yellow alders and cottonwoods as well. Driving from Corvallis, take Hwy 34, which follows the Alsea River through the town of Tidewater. Even through dull spats of cool rain, the river valley corridors glow with the warmth of fall color. Head to Newport via Hwy 20, where mushroom season is in full swing. 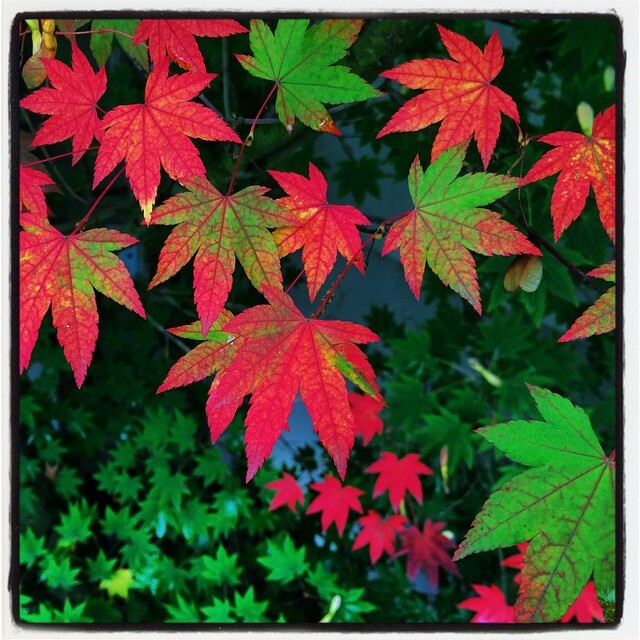 Though some trees may be evergreen, the forest floor is teeming with brilliant color. Pops of orange, purple and red peek through fallen leaves and debris. The Oregon Coast boasts a wider variety of mushroom species than anywhere else in the world. This weekend, lace up your boots, and get a jump on these little guys! 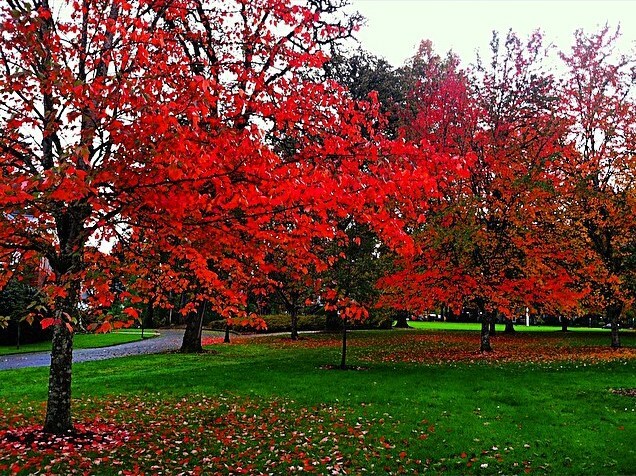 The Willamette Valley is currently stunning as the fall season has definitely reached its peak. Beautiful treetops colored in purple, pink, orange, and yellow line neighborhood streets, can be seen from highways, and all along the banks of the Willamette and McKenzie Rivers. Mount your bicycle and cruise down some of downtown Eugene’s newly paved city blocks. 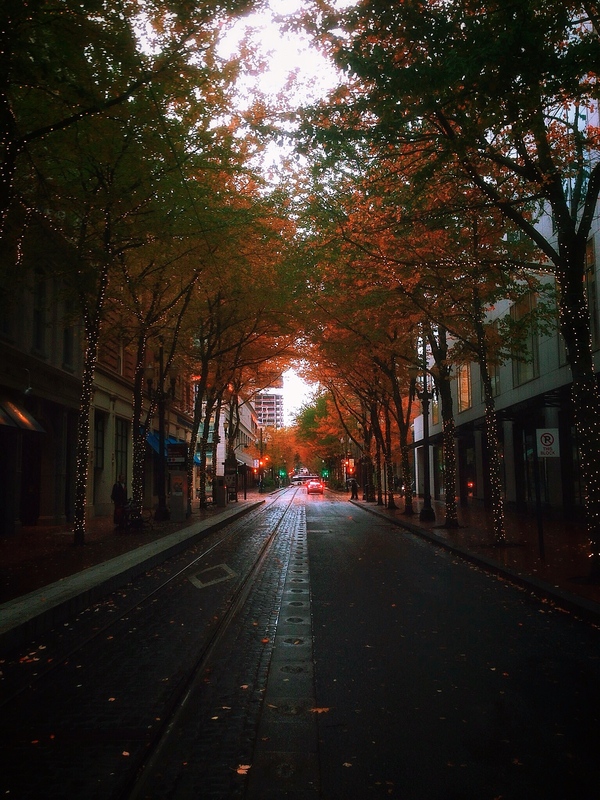 For a short and scenic ride, take 5th Street to High, and wind your way to W 3rd Avenue. Cruise up Skinner Butte, a local viewpoint that overlooks a good portion of Eugene. After taking pictures, reward yourself with a fast-paced, downhill decent. In Corvallis, experience the 12th Annual Philomath Open Studio Tour. Explore beautiful back roads as you embark on a self-guided tour of open artist studios this weekend and next, from noon to 5 p.m. 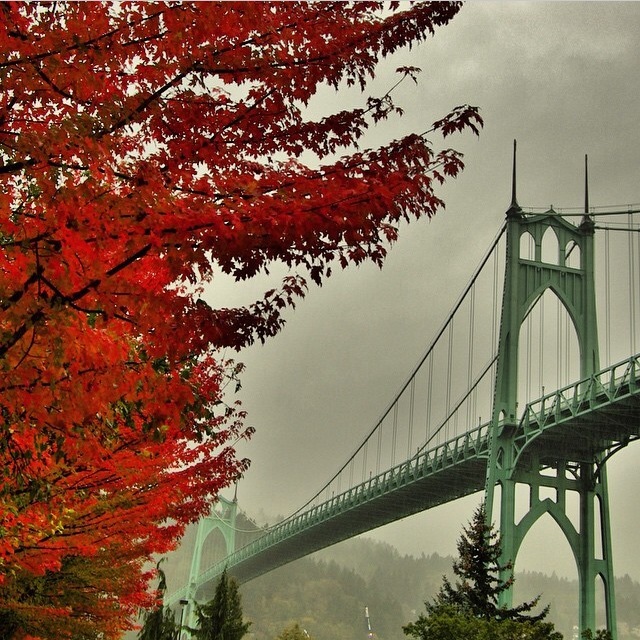 Rain is coming, but that doesn’t keep us Oregonians inside. Dust off those galoshes and head to Council Crest Park, the highest point in the Tualatin Mountains (Portland’s West Hills). From this observation area, one can easily view several mountains of the Cascade Range, as well as the Willamette River, and acres of wonderfully colored deciduous and evergreen forest. Trees along the Columbia River Slough, beginning at Fairview Lake, are also looking vibrant. The Slough continues for 19 miles, and flows by the Zimmerman Heritage Farm Historical Park and Gardens. Visit the elusive Zimmerman House, open the 3rd Saturday of every month, for exotic flora, Oregon white oak, Siberian dogwood, and so much more! Have you ever opened your backdoor to discover a wild, rushing waterfall, complete with breathtaking views of lush, riparian vegetation? Standing at 208 feet tall and located directly outside of the Columbia Gorge Hotel, Wah Gwin Gwin Falls is just that. Flanked by firs, cottonwoods, big leaf maples, Oregon ash trees and twisted pines, this natural wonder (named for the Chinook Indian term for “rushing waters”) is an unbeatable sight. Though the grounds of this hotel are radiant any time of the year, in the fall, they truly shine. Colors have reached their peak in the Mt. 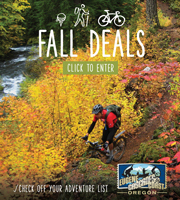 Hood and Gorge areas, so plan your trip, and take part in the season! It is more than halfway through October and Bend is still beautiful. 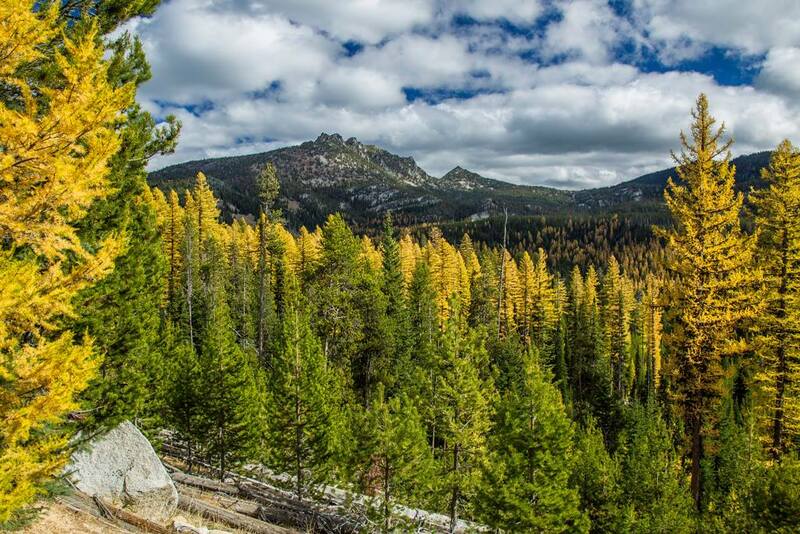 Take in particularly good views of Mount Bachelor as you drive along the Cascade Lakes Scenic Byway. Make Terrebonne your destination and visit Smith Rock State Park, one of Travel Oregon’s Seven Wonders of Oregon. This is an excellent trailhead, offering a number of ways to conquer this beautiful crag. Opt for the Misery Ridge Trail and head straight up its side, or traipse along the water via the Mesa Verde Trail. When you reach the top, gaze across the Crooked River and Haystack Reservoir for grand views of riparian foliage. Choose another direction, and drive westward on Hwy 126 toward Camp Sherman. 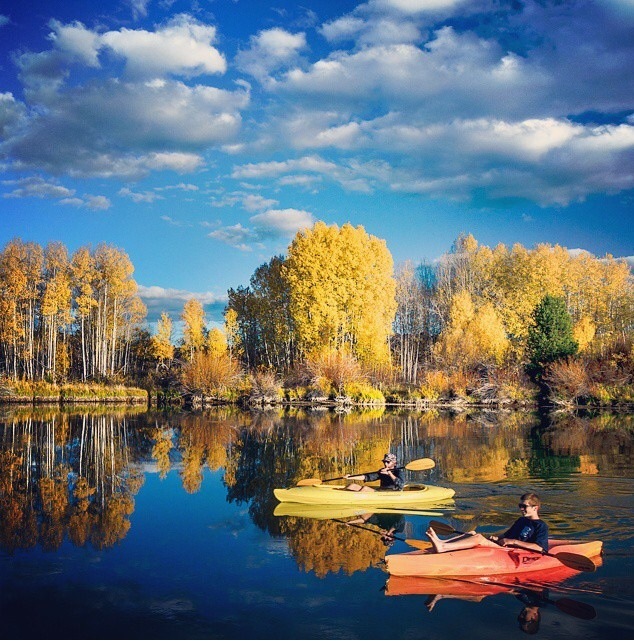 Located between Black Butte and the head of the Metolius River, Camp Sherman is a great place to spend an afternoon and enjoy autumnal color. Eastern Oregon is such a show off! Fall color is present at every turn, and if you’d like to catch it, now is the time. Do so by exploring one of Oregon’s most challenging sections of highway, Hwy 245, otherwise known as the Dooley Mountain Highway. Along this stretch, you will enjoy a tree line of golden aspen, as well as tamarack, which are turning beautifully right now. This twisting road reaches an elevation of 4,000 feet, and drivers are advised to take it easy on sharp corners, especially in stormy weather. As you zoom on through by car or by motorcycle, be on the lookout for deer, elk, and spectacular views of fall foliage! Fall is fleeting in Southern Oregon, and the evergreen trees near Crater Lake are dusted with snow. While this may be great news for winter sports enthusiasts, it feels a little bittersweet for leaf watchers like us. However, the Clearwater River Trail still offers hope of autumn visions. Clear blue pools, small waterfalls, and a dense canopy of old growth Douglas fir, cedar, and bright yellow alder trees await you on this two-mile trail. Located just past the Toketee Ranger Station, this trail is ideal for mountain biking and runs parallel to the Clearwater River. Check it out sooner than later, as more snow is predicted.